In Scrum Process Canvas, the scrum tool, perform the steps below to appoint a scrum master for your project. You may try the steps interactively by visiting the interactive product tour. In the Scrum Process Canvas, click on the gear button next to the work item Scrum Master to configure scrum master. 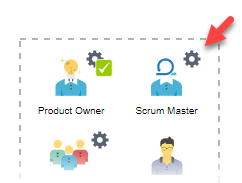 To perform the step, click on the action artifact Scrum Master. This lists the team members of this project. Make sure the members are added to this project in order to view them here. Click on a member to select him/her. Enter the responsibilities of product owner in this project. You may refer to the Instruction for ideas. Enter any additional information about this member as notes. Go back to the work item page via the breadcrumb. When you are done, click on Commit at the bottom right corner, and then select Complete from the popup menu.